Fr. Thomas Rosica, C.S.B., CEO of Salt and Light Catholic Media Foundation, was called to Rome during the Papal transition of February and March 2013 where he served as one of the English and French language spokespersons in the Holy See Press Office. In this capacity he worked closely with Fr. Federico Lombardi, S.J., Director of the Holy See Press Office and Vatican Radio in dealing with over 6000 journalists who had traveled to Rome to cover the momentous transition in the Church. Upon completion of his work after the mass of inauguration of Pope Francis, the Vatican asked Fr. Rosica to continue strengthening the relationship with English language journalists and heads of media organizations throughout the world. He continues to serve in the capacity of: "English language corresponding assistant to Holy See Press Office." The message below was sent out today by Fr. Rosica to over 250 media personnel as a background and further clarification on the Roman Curia. As you have seen and many of you have reported, Pope Francis' decision to appoint a new advisory group to review the Roma Curia has been widely accepted. Since April 13, 2013, many of you have sent me questions and requests for clarification on various dimensions of the Vatican communiqué. I have grouped together the questions and will offer some clarification below. They are my own thoughts that I have shared with Fr. Federico Lombardi, S.J. Fr. Lombardi found them to be helpful background information. Could you explain to us what is meant by the word ‘Roman Curia? 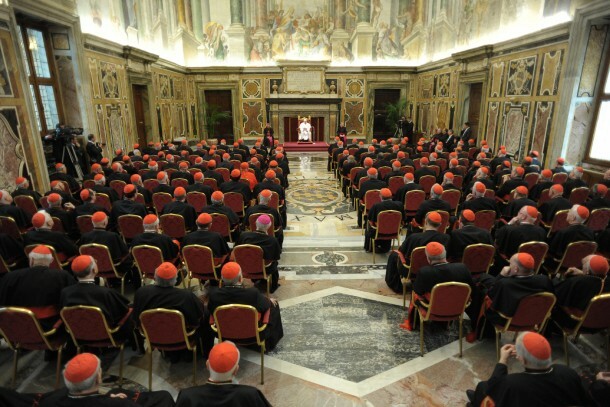 What and who makes up the Roman Curia? When the communiqué mentioned ‘Pastor Bonus’, what exactly is Pope Francis referring to? What is the newest or latest addition to the Roman Curia? Is it possible that further groups might be added? Fr. Rosica, what has been your own experience of the Roman Curia? You have worked with them for a long time. Why didn’t Pope Benedict or Pope John Paul II do anything to correct the problems and tensions? The word curia derives from the old Latin “covria” meaning "a gathering of men" (co, "together" vir, "man"). On one hand, any assembly, public or private, could be called a curia. In addition to the Roman curiae, voting assemblies known as curiae existed in other towns of Latium (Rome) and similar institutions existed in other parts of Italy. During the Roman Republic, local curiae were established in Italian and provincial municipalities and colonies. In imperial times, local magistrates were often elected by municipal senates, which also came to be known as curiae. The word curia also came to be applied to meeting places where various assemblies gathered, especially the meeting house of the Roman Senate Similar institutions existed in other towns and cities of Italy. In medieval times, a king's council was frequently referred to as a curia. Today, the most well-known curia is the governing body of the Roman Catholic Church. Pope Francis chose cardinals who have exercised their ministry in diocesan settings, suggesting that he wishes to create a system of Vatican administration more responsive to the needs of diocesan leaders. The advisory group is not a commission, committee, council, cabinet or executive body. It has no legislative power and its main function is to “advise” the Pope. The group will not in any way interfere in the normal functions of the Roman Curia, which helps the Pope in the daily governance of the Church. Seven Cardinals of the group are from the different continents, and one (Cardinal Bertello) is from the Vatican City State and not the Roman Curia.) The group of Cardinals will be coordinated by Cardinal Oscar Andrés Maradiaga Rodríguez and is drawn from across the Universal Church. The secretary of the group is Bishop Marcello Semeraro of Albano, Italy. Bishop Semeraro was the Special Secretary of the 2001 Synod of Bishops of which Cardinal Bergoglio was the General Relator. At that Synod, Cardinal Bergoglio was pressed into service as Relator after the prelate originally appointed to that role, Cardinal Edward Egan of New York, returned to his archdiocese in the wake of the 9/11 terrorist attack. The Bishop and Cardinal Bergoglio worked closely together at that Synod and know each other well. The group will help Pope Francis revise the Apostolic Constitution on the Roman Curia “Pastor bonus.” These words are Latin for “good shepherd” and indicate the first two words of the document in its original Latin text. “Pastor bonus” is the Apostolic Constitution of Pope John Paul II, promulgated on June 28, 1988. The document was itself a revision of the 1967 text that marked the last major reform of the Vatican bureaucracy undertaken by Pope Paul V1. It has effectively functioned as the blueprint for the administration of the Holy See and the Vatican City State. “Pastor Bonus” instituted a number of reforms in the process of running the central government of the Roman Catholic Church, as article 1 states "The Roman Curia is the complex of dicasteries (departments) and institutes which help the Roman Pontiff in the exercise of his supreme pastoral office for the good and service of the whole Church and of the particular Churches. It thus strengthens the unity of the faith and the communion of the people of God and promotes the mission proper to the Church in the world". http://www.vatican.va/holy_father/john_paul_ii/apost_constitutions/documents/hf_jp-ii_apc_19880628_pastor-bonus-index_en.html? ?Among the changes formulated in the 1988 constitution was the re-integration of the Council for Public Affairs of the Church into the Secretariat of State as the Section for Relations with States (the Second Section). For centuries, only cardinals were eligible for membership in the organs of the Holy See, but Pope Paul VI allowed diocesan bishops to be members following calls for collegiality at the Second Vatican Council. “Pastor Bonus” continued the opening of the central government of the church by allowing priests, deacons, religious and lay persons to be consultors and in some cases, even members of the various bodies. “Pastor Bonus” set out the roles of the Secretariat of State, Congregations, Tribunals, Pontifical Councils, Administrative Services and Pontifical Commissions of the Roman Curia. It also established the norms for the “Ad limina” visits of bishops to Rome and the relationship between the Holy See and the particular Churches and episcopal conferences. The Congregation of the Doctrine of the Faith watches over faith and morals. The Congregation for Bishops has special concern for the ministry of bishops. It facilitates the work of the naming of bishops; establishes, divides, and oversees dioceses (local churches). The Congregation for Divine Worship and the Discipline of the Sacraments has jurisdiction in matters involving the sacraments. It has a special concern for the liturgical life of the Church. The Congregation for the Clergy has disciplinary authority over both the clergy and the faithful generally. The Congregation for Institutes of Consecrated Life and for Societies of Apostolic Life has general jurisdiction over religious, consecrated women and men, and many religious communities and orders. The Congregation for the Evangelization of Peoples has almost general jurisdiction in missionary areas. This congregation also facilitates the naming of bishops to missionary countries. The Congregation for the Causes of Saints concerns itself with rites and ceremonies and prepares the causes of canonization and beatification. The Congregation Catholic universities under the authority of the Church. The Congregation for Oriental Churches has general authority over the Eastern Churches. The Apostolic Penitentiary grants dispensations and absolutions and has jurisdiction in cases of conscience and in some matters pertaining to indulgences. The Roman Rota hears appeals from decisions of lower tribunals and may be commissioned by the pope to hear certain cases in the first instance. The Apostolic Signature is the supreme court to which appeals from certain decisions of the Rota are directed. It acts in the name of the pope himself. There are numerous Pontifical Councils that are also part of the Roman Curia. These Councils include those of the Laity; for the Promotion of Christian Unity and its special commission for Religious Relations with the Jews; for the Family; for Justice and Peace; “Cor Unum;” for the Pastoral Care of Migrant and Itinerant Peoples; for Health Care; for Legislative Texts; Interreligious Dialogue; Culture; Social Communications and the newest Council - for the Promotion of the New Evangelization. The Pontifical Council for Promoting the New Evangelization is a dicastery of the Roman Curia whose creation was announced by Pope Benedict XVI on June 28, 2010, eve of the Feast of Saints Peter and Paul. This Pontifical Council was established as a Dicastery of the Roman Curia according to the Apostolic Constitution Pastor Bonus. On June 30, 2010, Pope Benedict XVI appointed as its first President Archbishop Salvatore Fisichella, until then President of the Pontifical Academy for Life. On Friday, January 25, 2013, Pope Benedict XVI, in an Apostolic Letter issued Motu Proprio (on his own initiative), transferred the oversight of catechesis from the Congregation for the Clergy to the Pontifical Council for the Promotion of the New Evangelization. There are also a number of Pontifical Commissions that form part of the Roman Curia: the Pontifical Biblical Commission and the International Theological Commission; the Commission for Latin America; the Commission of “Eccleisa Dei”; for Sacred Archeology; and the Interdicasterial Commission for the Catechism of the Catholic Church. Finally there are a number of Pontifical Academies: of Sciences, Social Sciences; for Life; of St. Thomas Aquinas; the Theology; Marian Studies; of Fine Arts and Letters of the Virtuosi at the Pantheon; of Roman Academy of Archeology; of the Cult of Martyrs; for Latin, and the Pontifical Ecclesiastical Academy that trains diplomats for the Holy See. Pope Francis was elected at a time when many Church leaders were calling for changes in the Roman Curia, after a series of missteps that culminated in the “Vatileaks” scandal, the leaks of documents that pointed to tensions and difficulties in the Vatican bureaucracy. During the pre-conclave meetings, the cardinals also discussed how communication could be improved by involving local Churches through regular meetings between the Pope and bishops’ conferences. There was a clear call for greater collegiality. The establishment of this new advisory group was not done so much to avoid problems and scandals but to provide for a government that will help the Holy Father exercise his Petrine service of unity and presiding over the Church in charity. Pope Francis addressed the full staff of the Secretariat of State on April 12, the day before the advisory group of cardinals was announced. This very cordial visit manifested his deep gratitude, esteem and affection for their hard work, especially over the past months. During the momentous days of Papal transition in Rome, and in the days and weeks following, I was frequently asked to comment on my own, personal experience of the members of the Roman Curia, or the people who work at the Vatican. In all honesty I must say that they vast majority of the individuals with whom I have dealt and whom I know well are among the most dedicated, committed, generous, selfless individuals I have ever met. Most of them work quietly behind the scenes to keep the central government of the Church functioning through good times and bad times. When difficulties or scandals have arisen over the past years, it is far too easy to overemphasize the defects of any human system or operation. The Church administration is not run by angels disconnected from the human reality and human imperfections. It is staffed by people like us, with all of our good qualities and human frailty and weakness. The one lasting impression on my mind and heart from my recent work in the Holy See Press Office goes back to February 28, 2013, the day that Pope Benedict XVI stepped down from the papacy and left the Vatican in the evening. When the Holy Father descended into the courtyard of St. Damasus, before him was the entire staff of the Secretariart of State – clerical and lay, religious and prelates - and many others who had served him for the previous eight years of his pontificate. As the television cameras offered these moving images to the entire world, one could see tears and sadness on the faces of the hundreds of people gathered to bid farewell to Benedict. I will never forget witnessing that moment, together with Fr. Lombardi in the Holy See Press Office. The sheer humanity of the scene unfolding in the courtyard of the Apostolic Palace reminded me and perhaps many of you, of the sincerity and love in the hearts of the vast majority of people who form the Roman Curia and serve the Church with dedication. Pope Francis is helping us all to highlight the best practices, dedication, selflessness and generosity of the many religious and laypeople who work in the Roman Curia and at the Vatican. He is also calling us all to greater transparency, generosity, simplicity and service of the Church and of humanity.